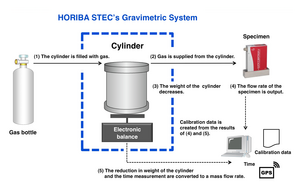 The results of accredited calibrations performed using the “Gravimetric System” developed in-house at the Kyoto Fukuchiyama Technology Center have been set as the top-level gas mass flow rate standards in the company, further improving the accuracy of Mass Flow Controller gas flow control devices—HORIBA STEC’s main product. This ISO/IEC 17025- accredited calibrated flow rate standard instrument will be supplied to each HORIBA STEC factory and further incorporated with scheduled shipments for FY 2018. Following the miniaturization and higher integration of semiconductor devices in semiconductor manufacturing equipment, recent years have seen a growing demand for higher precision of gas and liquid supply amounts and for improvements in reliability. As the world leader in the mass flow controller market (with 57% of the market share), to increase the accuracy of supply amounts, it is important for us not only to improve performance and reproducibility but also to maintain highly accurate data for use in adjustments. With this in mind, HORIBA STEC developed the “Gravimetric System” as a top-level gas mass flow rate standard, thereby obtaining ISO/IEC 17025 accreditation. Going forward, HORIBA STEC will strive to contribute to further development of the semiconductor industry by incorporating advancements in liquid measurement technology in our products. 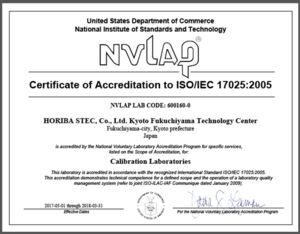 Regarding flow rate standards for adjustments of mass flow controllers prior to ISO/IEC 17025 accreditation, HORIBA STEC utilized flow-calibration services from companies offering traceability to the National Institute of Standards and Technology (NIST) in the U.S. or the National Metrology Institute of Japan (NMIJ). With ISO/IEC 17025 accreditation, HORIBA STEC has put in place the Gravimetric System, developed in-house, by installing an electronic balance on a floor within the facility that is not prone to the effects of vibrations. This balance measures changes in weight per unit of time and converts the results to a mass flow rate. The Gravimetric System will be incorporated as the top-level flow rate standard within HORIBA STEC. Established in December 2013, the Kyoto Fukuchiyama Technology Center is the third of HORIBA STEC’s development bases after the Kyoto Head Office and HORIBA Instruments Incorporated in the U.S. The Center’s main tasks are improving flow traceability systems for gas mass flow controllers and liquid mass flow controllers, measuring flow rates, and conducting liquid material vaporization testing using vaporizers. Offering the latest equipment in compliance with various relevant laws, the facility enables highly accurate testing of various liquids. In addition to the quality requirements for operating systems set forth in the ISO 9000(*) series, ISO/IEC 17025 includes requirements regarding technical management necessary for conducting tests/calibration (technical ability of calibration technicians, testing facility conditions, and traceability). As such, in addition to quality system reviews, laboratory accreditation examinations include proficiency testing that looks at whether the calibration technician has sufficient technical capabilities. *The ISO 9000 series of standards—set forth by the ISO (International Organization for Standardization)—is related to quality management systems. HORIBA STEC’s ISO/IEC 17025 accreditation applies to calibration using the Gravimetric System as well as chain-reaction and progressive calibration using standard instrument calibrated using the Gravimetric System for nitrogen, argon, oxygen, carbon tetrafluoride, sulfur hexafluoride, dry air, carbon dioxide, nitrogen dioxide, and other inert gases in the range of 0.012498 g/min to 62.49 g/min (10 mL/min to 50 L/min for nitrogen gas at 0°C and 1 atm). For more information, please see the Directory of Accredited Laboratories on the National Voluntary Laboratory Accreditation Program (NVLAP) accrediting body website (https://www.nist.gov/nvlap). Calibration results from a calibrating agency accredited by the ILAC’s MRA are recognized as equivalent to calibration certificates between mutually recognized signing authorities (IAJapan, JAB, etc. ).